BBC - iWonder - How has immigration changed Britain since WW2? How has immigration changed Britain since WW2? A labour shortage after WW2 sparks mass immigration that would transform the make-up of Britain. It starts with an influx from the Commonwealth, then the fall of the Iron Curtain, and those fleeing from dangerous regimes across the world. Since WW2, mass immigration has changed the face of Britain. Find out who came and why... and what happened to them once they got here. 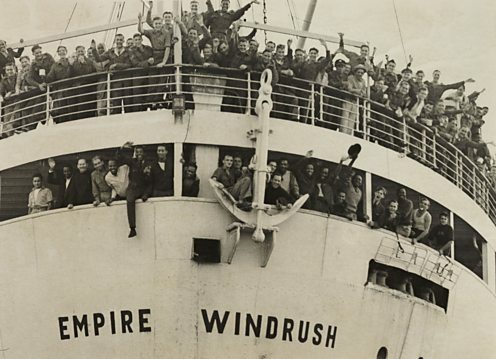 Jamaican immigrants arriving at Tilbury Dock in 1948 on the Empire Windrush. Answering Britain’s desperate labour shortage after the war, nearly 500 men arrive by ship from Jamaica. This marks the symbolic start of mass immigration not from Europe, but from the Commonwealth. They are encouraged by adverts for work, their sense of patriotism, and some want to re-join the armed forces having fought for Britain during the war. The British Nationalities Act gives all Commonwealth citizens free entry into Britain. They are welcomed by the press – but not by everyone. As Commonwealth immigration increases following the arrival of the Windrush, so does racial tension. Race riots erupt across the country, encouraged by right-wing pro-white groups, building on ill-feeling at competition for housing and jobs. Riots start in Liverpool in August 1948, and spread in the 1950s to Birmingham, Nottingham and west London. They culminate in the infamous Notting Hill riots in August 1958. The separate assaults of five black men by white youths in Shepherd's Bush and Notting Hill sparks unrest and at around midnight on 30 August rioting breaks out and lasts a week. 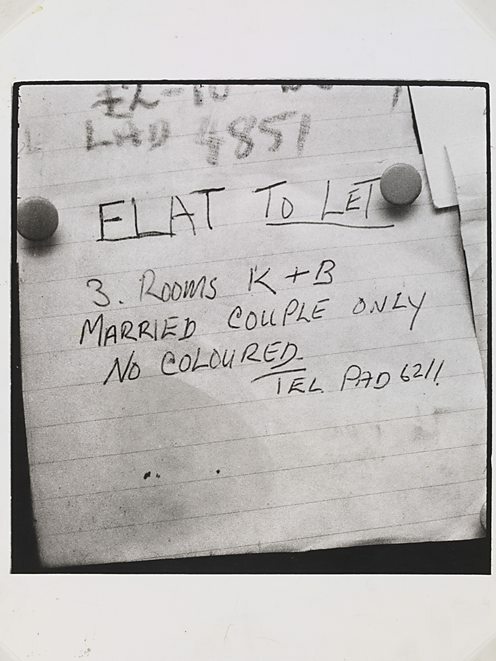 Racist advertisement for a room to let in Notting Hill in 1966. It would not have been outlawed under the act if it applied to a private room. Numbers of immigrants into Britain increases and tension builds. Triggered by race riots across the country, the Race Relations Act comes into force. The act outlaws racial discrimination in public places. It forbids discrimination on the "grounds of colour, race, or ethnic or national origins" and includes hotels and restaurants. However, it excludes not only private boarding houses, but shops as well. Conservative opponents to the law insist on making discrimination a civil offence, not a criminal one, causing Labour backbenchers and anti-racism campaigners to say the law is not tough enough. During the Empire, Britain encouraged thousands of Asians to move to Kenya. After independence in 1963, many chose to keep their British passports. Now the Kenyan government introduces a law insisting ‘foreigners’ can only hold a job until a Kenyan national can be found to replace them. It becomes impossible for Kenyan Asians to work in the country, and many have to give up their homes and businesses. Thousands of Kenyan Asians turn to Britain as a safe haven, emigrating to start a new life. 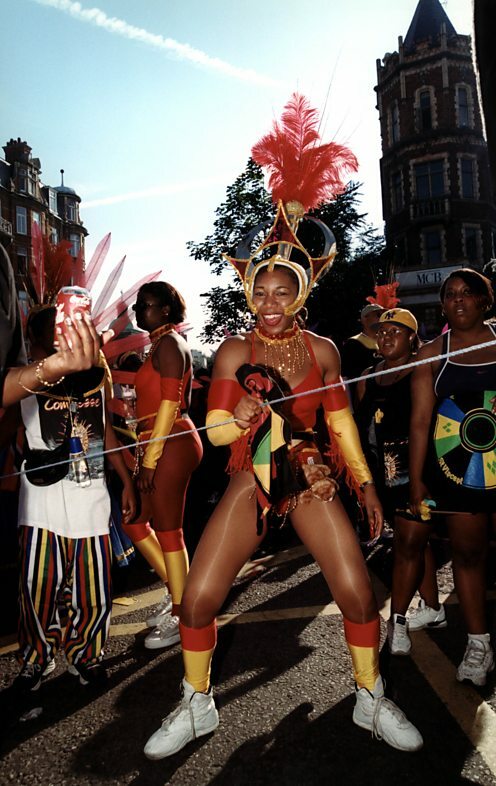 Starting in 1966, Notting Hill Carnival has gone from a small celebration of Carribbean culture to a gathering of 150,000 people. Through the 50s and 60s, immigration increases. The UK foreign-born population grows by over one million people to 6.4% of the total population. With job shortages back home, job vacancies in Britain and, until 1968, a policy of welcoming Commonwealth immigrants into Britain, numbers increase. These immigrants are not just living and working in Britain, but adding to its culture. By 1971 the immigrant population numbers over three million, including 171,000 who identify themselves as Jamaican origin, 313,000 from India and 676,000 from Ireland. People of Indian origin become the largest immigrant group in the 2011 census. 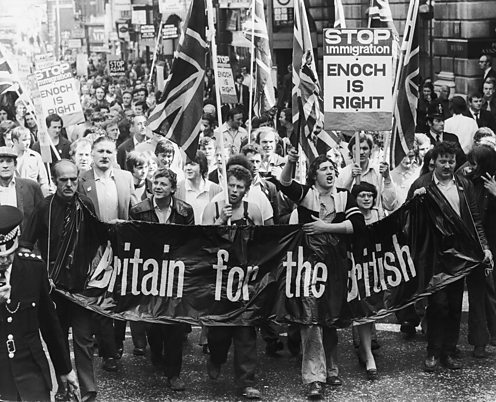 Anti-immigration protestors march to the Home Office in August 1972. Legislation is introduced to limit the numbers of people moving to Britain from the Commonwealth, even if they have British passports. In a 1968 speech, Conservative politician Enoch Powell predicted "rivers of blood" brought on by anti-discrimination laws. Although sacked from the shadow cabinet, he gained support from around the UK. Four years later, new immigration restrictions mean that British passport holders born overseas can only settle in Britain if they have a work permit and a parent or grandparent born in the UK. This effectively made immigration more difficult for non-white Britons born overseas. Like the Roman, I seem to see the river Tiber foaming with much blood. Idi Amin committed crimes against his own African people and expelled Asians, Israelis and Britons from Uganda. 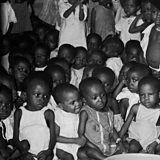 Ugandan Dictator Idi Amin expels 80,000 African-Asians, Israelis and Britons from Uganda. Many flock to Britain. 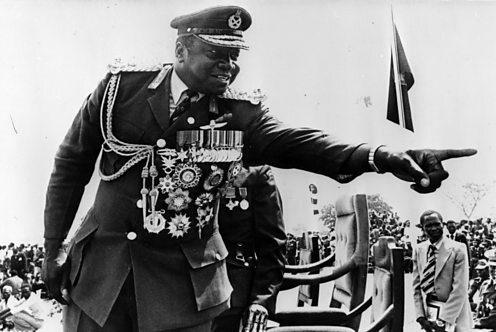 President Idi Amin of Uganda is one of the most brutal dictators of post-independence Africa. He sends out killing squads to eliminate political opponents. He then targets African-Asians, and expels over 80,000 from Uganda, seizing their assets. This move is later largely blamed for the collapse of the Ugandan economy. As immigrants to Uganda from Commonwealth countries, many have British passports and in two months the UK admits 28,000 of them. 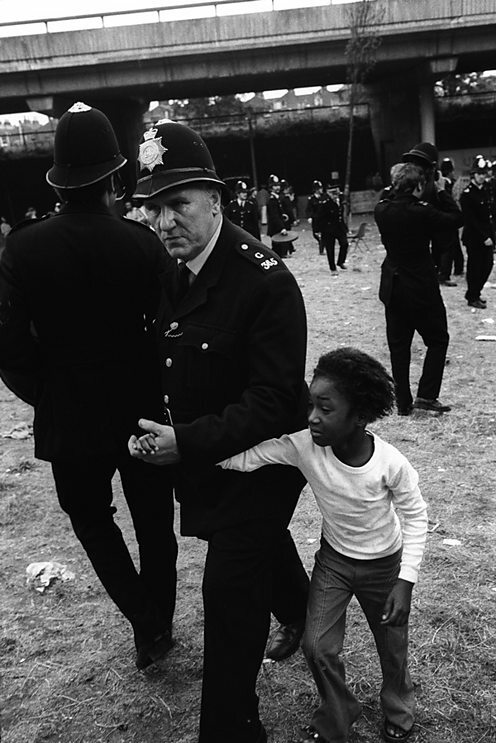 A policeman leads a young girl to safety during the Notting Hill Carnival. The government establishes the Commission for Racial Equality (CRE), the statutory body charged with tackling racial discrimination. The anti-discrimination laws of 1965 and 1968 are considered ineffective. A new 1976 law replaces them and establishes the CRE. Against a background of high unemployment and racial tension, the commission's duties are to work towards the elimination of racial discrimination, to promote equal opportunities and good relations between racial groups. It suggests extending the existing law to protect groups defined not only by race, colour, nationality or ethnicity, but also by religious belief. An arrest in Brixton on the second day of the riots. 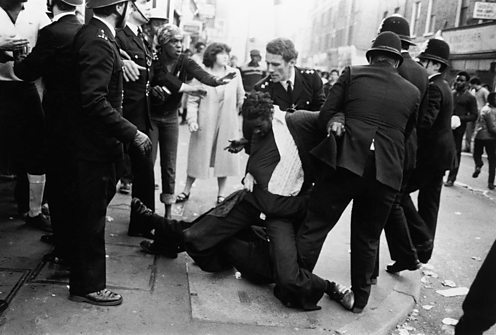 Following the 1981 riots, the Scarman report prompted changes to policing. Riots erupt in Brixton. There is massive civil unrest, accusations of police ‘heavy handedness’ and over 300 people are injured. In a huge anti-crime operation, the Metropolitan Police uses powers of stop and search. Over 1,000 people are stopped in Brixton in six days. Black men feel discriminated against; tensions build. Rioting erupts after an arrest sparks violence. The mix of racial tensions and poor police relations are not unique to Brixton. There had been riots in Bristol the previous year, then following Brixton in Chapeltown (Leeds), Toxteth (Liverpool), Moss Side (Manchester) and Handsworth (Birmingham). 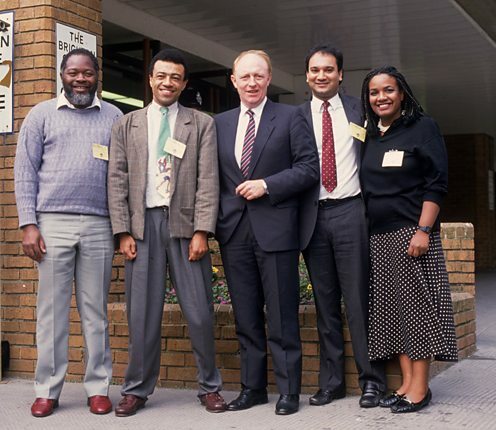 MPs Bernie Grant, Paul Boateng, Keith Vaz and Diane Abbott, with Labour leader Neil Kinnock, following their election in 1987. Four non-white MPs are elected in the general election. Immigrants Keith Vaz and Bernie Grant, and children of immigrants Diane Abbott and Paul Boateng, are elected as Members of Parliament for the Labour party. Britain's first non-white immigrant MP was Dadabhai Naoroj from Mumbai, who was a Liberal MP from 1892 to 1895. Diane Abbott is the first ever black woman MP and these four are the first non-white MPs to be elected since 1945. As the descendent of slaves I must believe in the recognition of every human's essential humanity. Ethnic Albanian refugees fleeing Kosovo. Following the fall of the Iron Curtain, Eastern Europeans flee political and racial persecution, while others seek a better life in Western Europe. 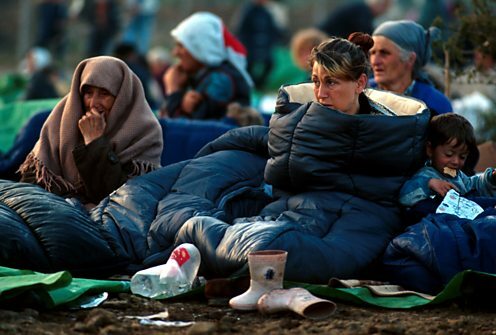 Many come from Kosovo where the ethnic Albanians flee the former Yugoslavia in the face of 'ethnic cleansing'. As a result, in 1998, the UK has more than 46,000 applications for assylum, a 42% rise over the previous year. Asylum seeker applications grow. In 2000, 125,000 people are allowed to settle in the UK. In Burnley, the British National Party (BNP) win three council seats after racial tensions are blamed for riots in northern towns. The far-right nationalist BNP wants to stop immigration completely and repatriate all foreigners. Labour councillor Stuart Caddey, leader of Burnley borough council, says he would refuse to work with a "racist" party like the BNP. "We will not work with the BNP, a fascist organisation. I'm quite clear on that." Despite this, the BNP go on to peak at 55 council seats nationally in 2008, before dropping to two in 2011. 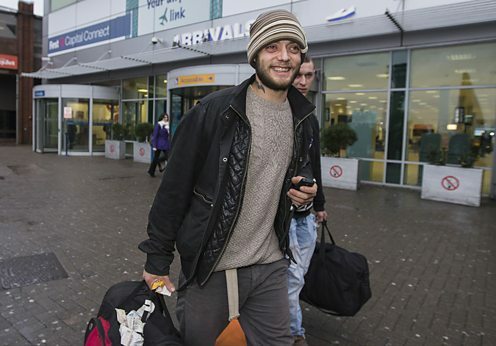 Victor Spirescu greeted by reporters upon his arrival in the UK from Romania. Romanians and Bulgarians are now allowed to work in the UK, seven years after their countries joined the EU, sparking fears for British jobs. This prompts a media frenzy with claims that Britain will be flooded with immigrants from these countries. However, on the day, journalists found only one man entering Britain from Romania. Victor Spirescu became a media sensation. A spokeswoman for the Romanian foreign ministry said some of the media coverage in the UK had bordered on racism. 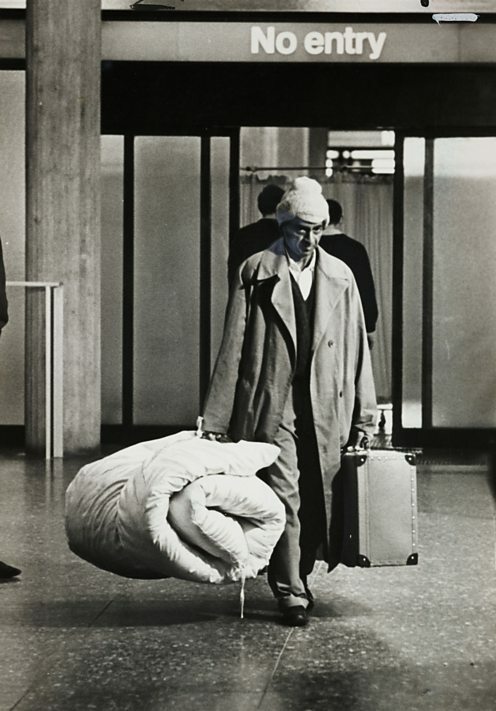 There isn't going to be an invasion of Romanians... Not all Romanians, young and old, are going to get on a plane. 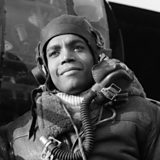 How did the heroes of the Caribbean help win WW2? 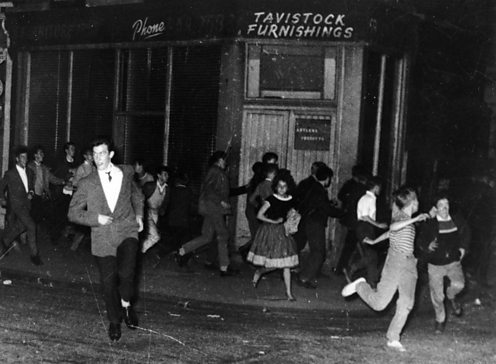 The "forgotten" riot: Nottingham's race riot in August 1958.